Want a fast, reliable, and eco-friendly way to get to O’Hare from anywhere in the Midwest? It’s not an impossible dream. High-speed rail is the answer. Bringing it to O’Hare is what we’re all about. And we need your help. Take action now and you’ll make a big difference. Tell Gov. Pritzker to create a statewide passenger rail program including direct access to O'Hare. O'Hare has more non-stop flights to international destinations than all other airports in the Midwest combined. O’Hare is the Midwest’s gateway to the world. It has more international destinations than all other airports in the Midwest combined. But getting there usually means a long car drive or a cramped regional flight. Pick your poison: Traffic jams or unreliable feeder flights. And long waits in either case. Everyone is fed up with these options. Executives in downtown Chicago, students in Champaign, orthopedic device designers in Warsaw, Indiana. We all want a fast, reliable, and stress-free way to get to O’Hare. 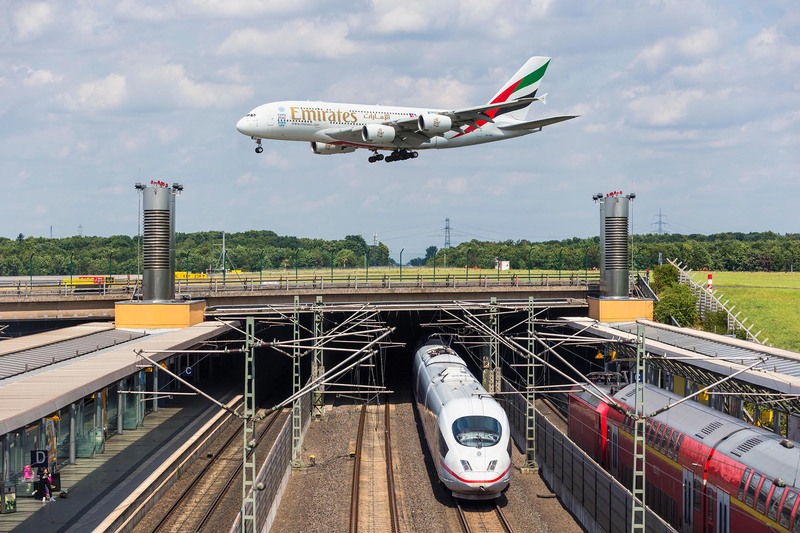 The world's top airports, like Dusseldorf in Germany, have easy connections between trains and planes. A Midwest high-speed rail network would put 45 million people within a 3-hour train ride of O’Hare. The truth is that it doesn’t have to be this way. And shouldn’t be. O’Hare does long-haul domestic and international flights really well. So it’s odd that much of its capacity is devoted to tiny “puddle jumper” planes that shuttle people to O’Hare from around the region. These connector flights are frequently cancelled in bad weather, or when passenger loads are light. So business travelers often rent a car instead of taking the risk. It’s a radically inefficient system. It makes no sense for anyone. Not for airlines. Not for travelers. And certainly not for the airport itself or the City of Chicago. Replacing puddle jumpers with train service will open capacity for big planes and long-haul domestic and international flights. It’ll introduce reliability to the system. And it’ll be a major win for everyone. A Midwest high-speed rail network would put 45 million people within a 3-hour train ride of O’Hare. Most trips will take much less than that, of course. Instead of idling in traffic jams or sitting in the airport and on runways, travelers can work on the train—or just relax. And, because O’Hare charges more in landing fees for big planes than small ones, Chicago will also bring in more money. That’ll help pay for the airport’s ongoing expansion project, while allowing O’Hare to do what it does best—focusing on long-haul flights. Since longer flights are more profitable than puddle jumpers, more of them means more revenue for the airlines, too. A bonus? Trains will slash carbon emissions dramatically. They’re great for the environment. Chicago is increasing capacity at O’Hare with a long-term expansion project. That’s great. But the expansion won’t make it any easier to get to the airport. It’ll make it harder by increasing congestion. 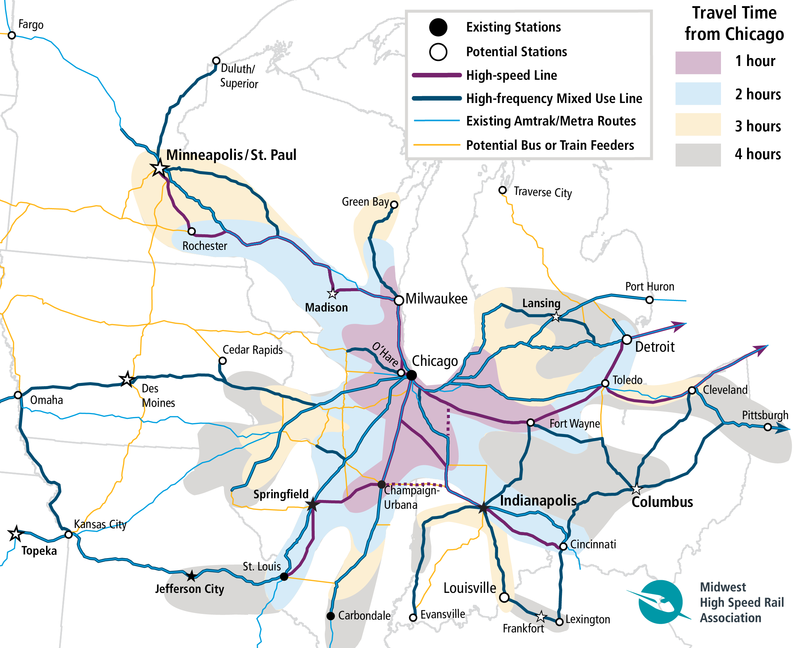 That's why building a Midwest high-speed rail network is vital. 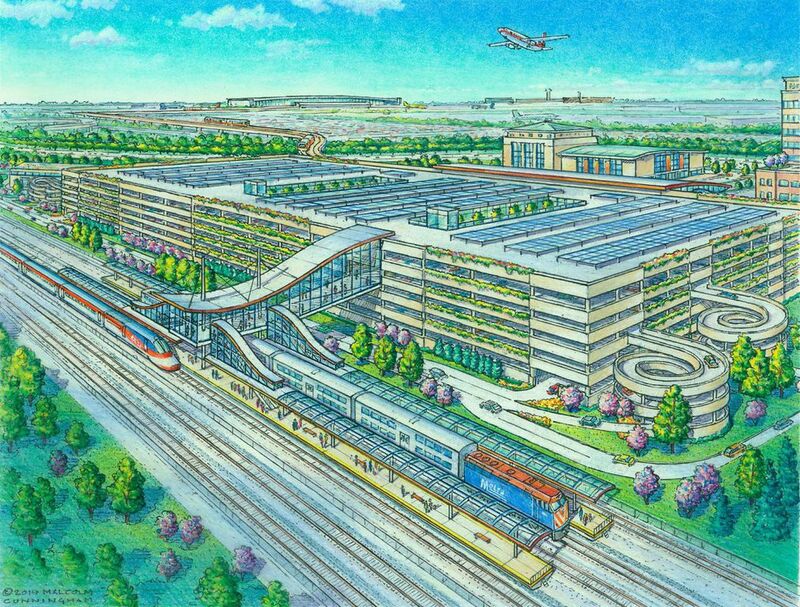 Adding a train station to the airport's new ground transportation hub would let trains from around the Chicago region and the Midwest stop at O'Hare. A new ground transportation hub is part of the ongoing O’Hare expansion. This new structure will be the home of rental cars, hotel shuttles, and regional buses. It will be connected to the terminals by the airport transit system. It also happens to be right next to the tracks that host Metra’s North Central service. Adding a train station here would make it easy to hop off the train and catch the airport shuttle to your terminal. Trains from all over the Chicago region and around the Midwest could stop here. Chicago could also build a track right to Terminal 2 for express trains from downtown. O'Hare is well-connected to a network of existing tracks and rights-of-way that can be upgraded to bring fast trains to the airport. Once there’s a station, there can be trains. The tracks are already in place for trains from Chicago Union Station, but O’Hare needs trains from more than just downtown. By adding track to existing Metra lines, trains from around the Chicago region—and the entire Midwest—can stop at O’Hare. Coming from Barrington? Easy. Aurora? No sweat. McCormick Place, Hyde Park, the south suburbs? It’ll be a one-seat ride to O’Hare with our CrossRail Chicago proposal. And what about the trains from places around the Midwest that replace those puddle-jumper flights? Amtrak trains from Milwaukee, Champaign, Kalamazoo, almost anywhere, can make a detour or extend their trip past downtown Chicago and take you directly to O’Hare. With the later addition of new high-speed track, these trains from around the Midwest can even be faster than flying. Until then, they’ll definitely be easier, more comfortable, cheaper and greener than short connecting flights. 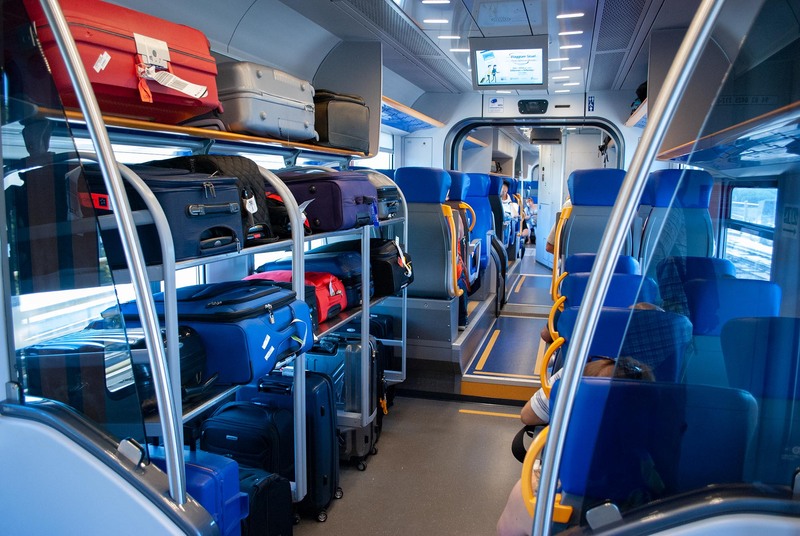 Modern trains have convenient features like spacious luggage racks near the doors. Once the station and tracks are in place, the trick is to run the right kind of trains. The aging cars that Metra and Amtrak use today require you to climb stairs, which is difficult when you’re carrying luggage. Modern train equipment has bigger doors with fewer or no steps to climb. They have luggage racks near the doors and wide aisles that make it easy to get on and off. They also have spaces for bikes and are easier to use for people in wheelchairs. With modern locomotives, trains are quieter, cleaner and more fuel efficient. Or, the trains can have the engines distributed throughout, so a separate locomotive isn’t needed. Either way, modern train designs are lighter but also stronger, so they not only start and stop faster, they’re safer, too. Our immediate goal is to get trains from around the Chicago region and the Midwest running to and from the O’Hare. The ultimate goal is to create a regional high-speed network with the airport at its heart. How does starting with O’Hare lead to our big vision? See our Illinois Fast Track Initiative, which includes CrossRail Chicago, the “spine” of the regional network. Ready to take the train to your plane? Send a message today. We've made it easy to tell your elected officials in Washington, D.C. (and Springfield, Illinois!) that O'Hare needs trains! Sign the petition asking Governor Pritzker to create a statewide passenger rail program including direct access to O'Hare.